You might not know that but I have decided to step again in the light of the day and to actually interact with this beautiful contemporary world because, enough hiding is enough hiding. So where should start ? 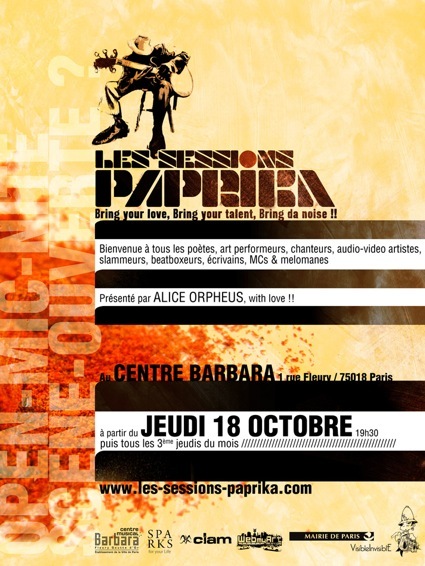 This coming Thursday (October 18 2012) I will be the first of a new type of open mic in Paris : Les Sessions Paprika. Produced by the Centre Barbara and organized by Music Event director Alfie, the Paprika sessions is an monthly open mic session that is going to try to give you a feel of what Paris acoustic soul has to offer. From singer songwriters, to dancers, to instrumentalists, known or unknown, you will get to listen and to watch 15 artists for 8 minutes each , supported by Rodolph Lauretta backing band , in the pretty child and creative environment of Centre Barbara. And guess what ? I am going to be the Host of Les Sessions Paprika which also supported by both Clam Magazine and Sparks for your life dirty skills & milk ! So you’ve got to come along if you are in Paris Thursday night ( 1 rue fleury 75018 Paris, Thursday the 18th of October 2012 at 7.30 pm ) because we are going to be having a freaking great time ! Here are 2 artists and I so you can get a taste of the soul the heart and the goal.